In fact, it was all I ate when I was pregnant with Nikola. It's yummy, easy to chow on the go and is also a great comfort food. Nothing beats pizza and a movie at home on a lazy Sunday night. My favorites are classic cheese, pepperoni, supreme, and veggie. Even better when the crust is stuffed with even more cheese! 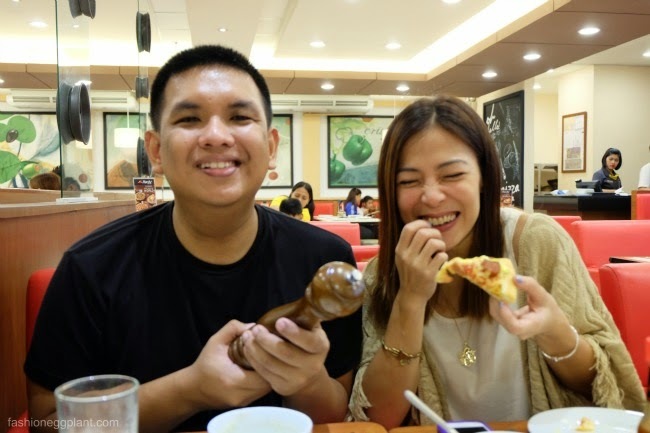 Me and Nikola often fight over the last couple of slices so we always end up getting the buy 1 take 1 pizza deals of Pizza Hut. 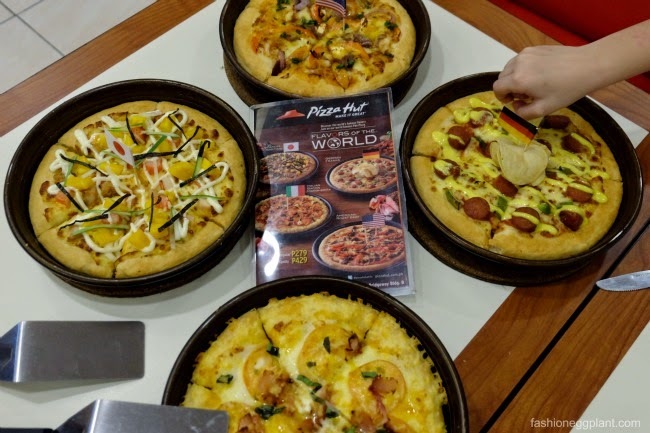 As much as I love all these flavors with all my heart (:P), I am still open to trying new varieties and that's a good thing because if not, I would never have discovered Pizza Hut's latest offering called "Flavors Of The World". Italian Bacon Margherita Pizza inspired by Italy - fresh tomatoes and basil, imported mozzarella cheese, cheddar and cream cheese topped with bacon. This simple combination comes together to bring you something unforgettable! 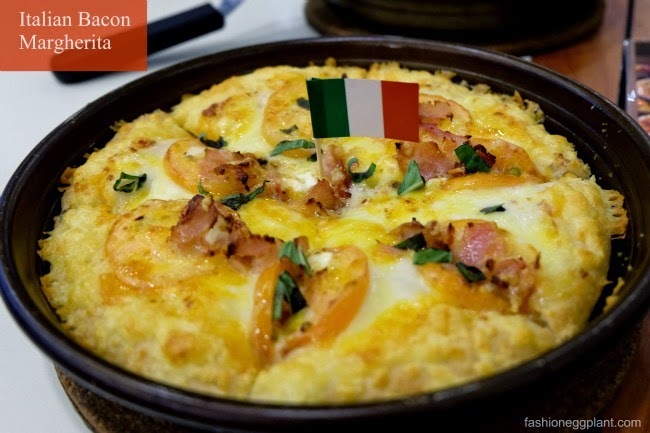 Imagine sinking your teeth into juicy tomatoes covered in cheesy, heavenly goo with a crust that is airy and chewy at the same time...It doesn't just taste good, the combination of different textures is also amazing. Bits of bacon add just the right amount of salt and fat to keep things interesting yet not overpowering and you end with a crust that is covered in crunchy, toasted cheese. Get this stuffed and I guarantee, it will be your new favorite too! 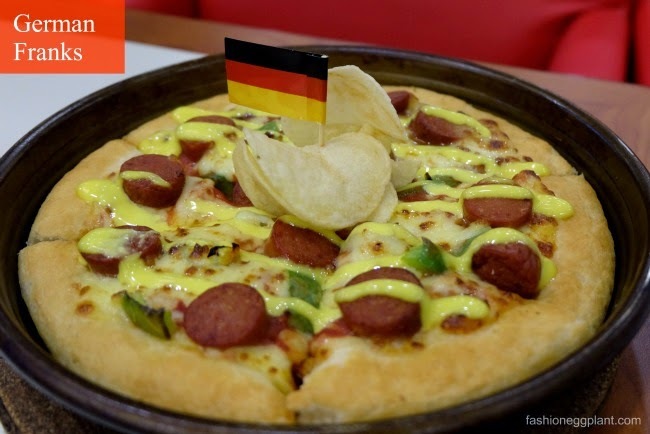 German Franks from Germany - favorite German franks and green bell peppers on a bed of melted double mozzarella with a drizzle of mayo mustard and crowned with potato crisps. This is richer, heavier and saltier than the Italian variant so it's great for people who are into junk food. However, I do have to say that the mayo mustard does a great job of neutralizing the palette so all the other flavors don't come on too strong. Japanese Crab Maki - mixed crabsticks and chicken chunks, topped with diced fresh mango, julienned cucumber and nori strips on a thousand island dressing. This was actually a pleasant surprise. 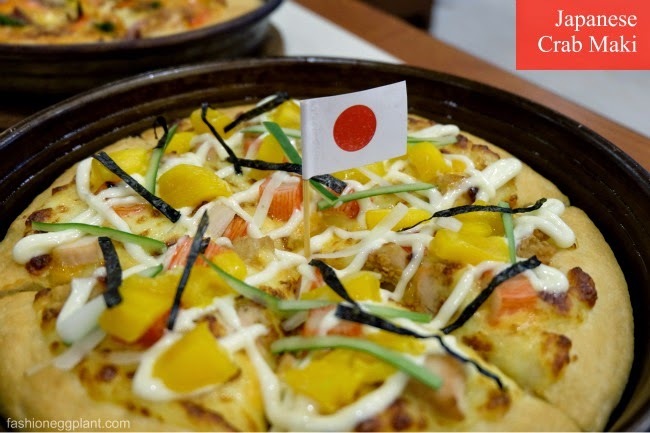 I was a little iffy at first about having mangoes, mayo and crabsticks on my pizza but I actually enjoyed this very much. It's light and refreshing, perfect for warmer days with an ice cold glass of soda. The flavor sort of reminds me of those yummy, cold lobster/crab sandwiches. Delish! Be brave and order this, it's definitely worth trying. American Roast Beef Pizza - succulent tasting beef, fresh tomatoes and onions, mozzarella cheese, cheddar and cream cheese. Like I said, my favorite of all was the Margherita. But I am having so much trouble picking between this and the crab maki for second place. They are both really good but this one is a meal in itself. A mouthwatering combination of 3 different cheeses and super tender beef slices. I wouldn't go so far as to call it Tex-Mex but it is somewhat Fajita-ish with the contrast of the cream cheese against the cheddar and beef juices. Men will go ga-ga over this. It is a protein junkie's dream come true and it is truly, truly scrumptious! Flavors Of The World Pizza can be included in your favorite Hut Feast Combo Meals at no extra cost! and for 8 pax at just P1,299! And of course my favorite of all, the Hot Deals delivery promo where you get 2 Family Pan Pizza's for just P499! That's 2 for the price of one.